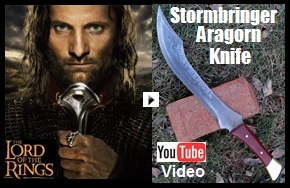 Stormbringer Aragorn Knife – Influenced from Lord of the Rings. See Pictures, Prices, and Descriptions. Made by Scorpion Swords & Knives. Influenced from the knife Aragorn (nicknamed Strider) used in Lord of the Rings. Aragorn was eventually crowned King Elessar Telcontar ("Elfstone Strider") of Gondor. This is our 2nd version of the knife with a touch of our own style.